You have me thinking again, Mr. Peterson. Today it’s with your post, “You Need to Be Responsive“. My own blogs are responsive and so they display well on multiple device types. My blog on a computer browser. My blog on a phone browser. 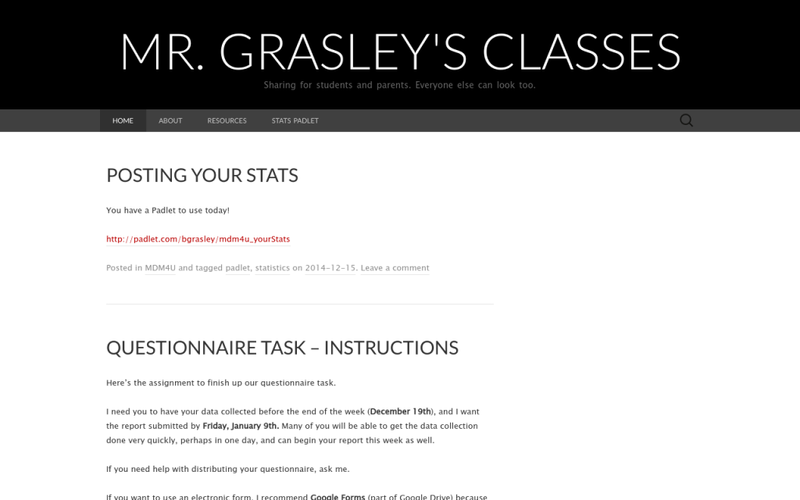 Students tell me they like the theme (The Suits Theme) on my class blog; they say it looks professional. The class blog in a computer browser. 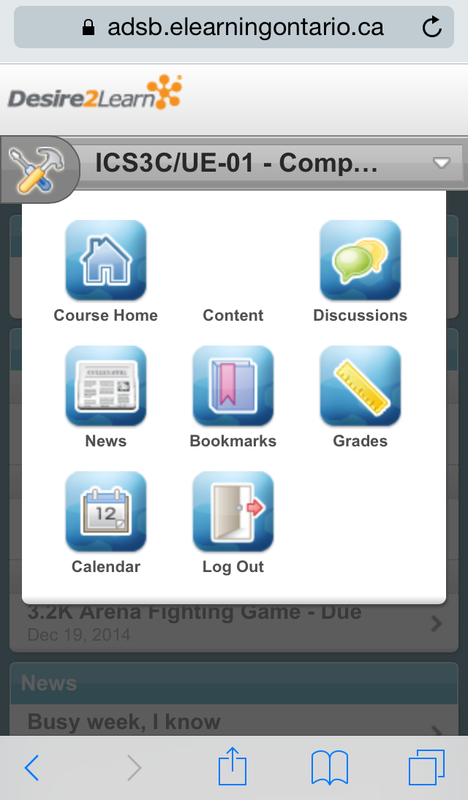 The class blog on a phone browser. However my e-learning course is less responsive. 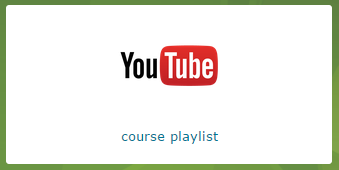 There is a mobile interface which becomes active when you use mobile device, but there are a couple of components on my course homepage which only appear using the desktop interface (custom widgets with links to the Padlet and the YouTube playlist for the course). 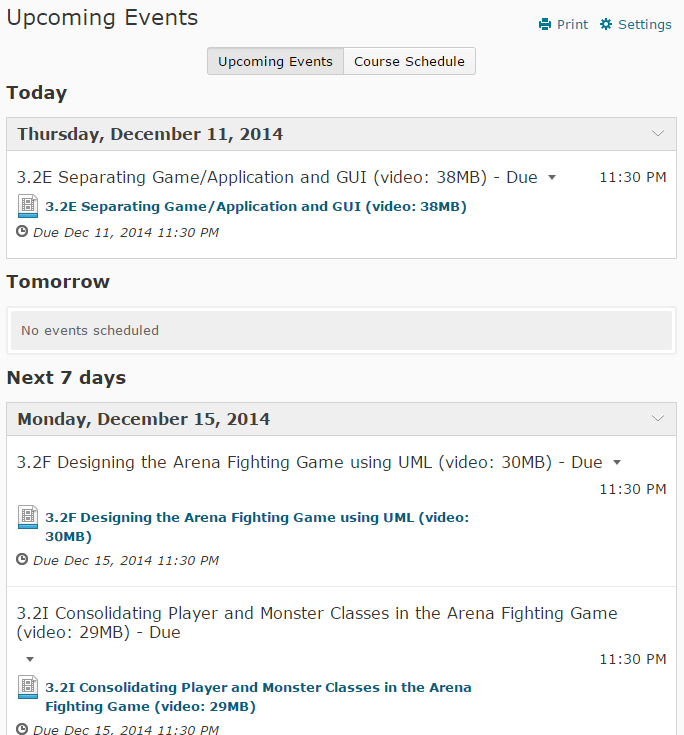 Some course tools aren’t available in this view (e.g. the Checklist Tool). My course homepage on a computer browser. 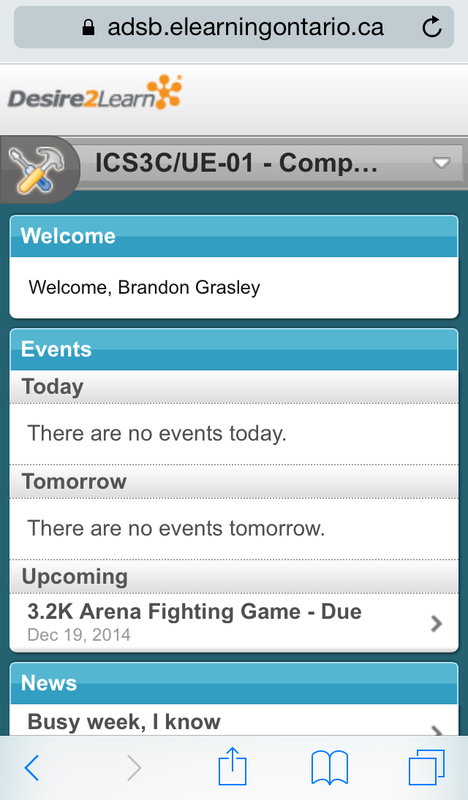 Course homepage in the mobile view. Tools in the mobile view. 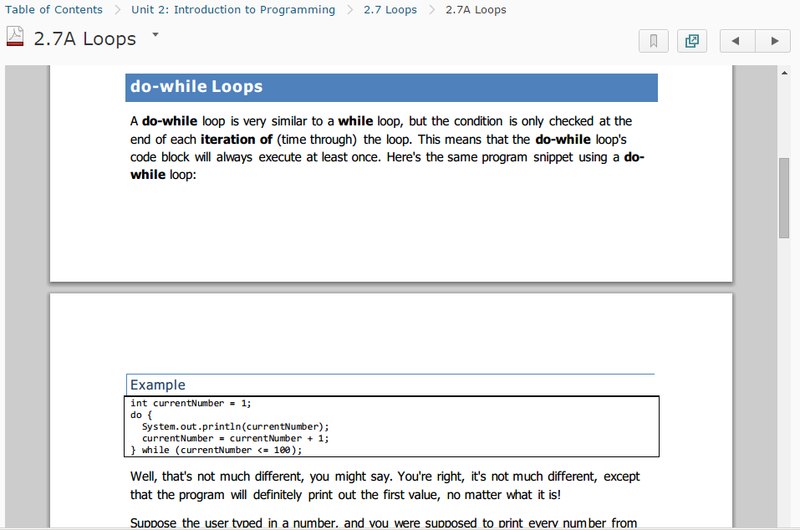 What’s more, I have created quite a few PDF files for the programming concepts in the course. These files, because they are paginated, are not responsive. Honestly, I don’t remember considering that issue when finally deciding to use PDFs. Since students are coding on computers anyway perhaps it doesn’t matter that much. And other stuff, like news and discussions, are mobile-friendly. But I’ve unintentionally made it difficult for them to use small, mobile devices to keep up with the “text” part of the course (i.e. when they’re not actively programming). I do have a lot of video on there, which is (I think) fairly accessible. I’ll have to think about whether it’s worth fixing the responsiveness of those PDFs. I teach Math in Ontario. We have an “Achievement Chart” (see pages 28-29) which lists four categories of knowledge and skills. 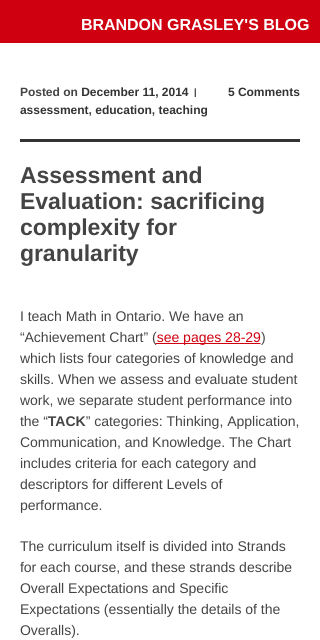 When we assess and evaluate student work, we separate student performance into the “TACK” categories: Thinking, Application, Communication, and Knowledge. The Chart includes criteria for each category and descriptors for different Levels of performance. The curriculum itself is divided into Strands for each course, and these strands describe Overall Expectations and Specific Expectations (essentially the details of the Overalls). So when evaluating student work, we evaluate Overall Expectations in the context of the four Categories of Knowledge and Skills, and we should have a “balance” between the categories (not equality, necessarily). The truth is that I’m having some trouble with it. I posted a little while ago that I was struggling with the Thinking category, and that’s still true. But there is another issue that’s more pervasive and possibly more problematic. When trying to separate out the different components of student performance, we would often ask questions that “highlight” a particular area. Essentially we would write questions that would isolate a student’s understanding of that area. That’s a fairly mathematical, scientific-sounding thing to do, after all. Control for the other variables, and then effect you see is a result of the variable you’re hoping to measure. For example, we wouldn’t ask a student to solve a bunch of systems of equations which only had “nasty” numbers like fractions in them (or other unfairly-maligned number types) because we fear that a student who is terrible with the fractions will stumble over them and be unable to demonstrate their ability to solve the system of equations. So we remove the “barrier” of numerical nastiness in order to let the skill we’re interested in, solving the system, be the problematic skill. But we do that over and over again, isolating skill after skill in an effort to pinpoint student learning in each area, make a plan for improvement, and report the results. And in the end, students seem to be learning tiny little skills, procedures, and algorithms, which will help them to be successful on our tests without developing the connections between concepts or long-term understanding. We want to have “authentic, real-world problems” in our teaching so that students can make connections to the real world and (fingers crossed) want to be engaged in the learning. But authentic problems are complex problems, and by julienning our concepts into matchstick-size steps we are sacrificing meaningful learning opportunities. What if we didn’t have to evaluate? We’re slicing these concepts so finely because we’re aiming for that granularity. We want to be fair to our students and not penalize their system-solving because of their fraction-failings. But if there were no marks to attach, would we do the same thing? 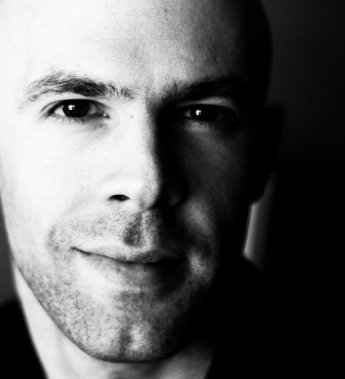 Would we work so hard at isolating skills, or would we take a broader approach? I’m teaching Data Management right now, and the strand dealing with statistical analysis has a lot of procedure skills listed followed by a bunch of analysis skills. If I evaluate the students’ abilities in summarizing data with a scatter plot and line-of-best-fit, do I then ask them to analyze and interpret the data based on their own plot and line? What if they mess up the plot; don’t I then have to accept their analysis based on their initial errors? Oh wait, I could make them summarize the data, then I can give them a summary for a different data set and ask them to draw conclusions from that summary! Then they’ll have the same starting point for analysis, and they can’t accidentally make the question too easy or hard! But I’ve just messed up one of my goals, then: I’ve removed the authenticity and retained the ownership of the task. I haven’t empowered my students if I do it this way, and I’ve possibly sacrificed meaningful complexity. Worse, I’m only doing this because I need to evaluate them. I’d much rather require them to gather, summarize, and analyze data that interest them and then discuss it with them, helping them to learn and grow in that richer context. …I don’t have answers. Sorry. I’m trying hard to make the work meaningful and the learning deep while still exposing as much detail about student thinking as I can. I’m sure in the end it’ll be a trade-off. I’m teaching ICS3C/3U (Computer Programming/Computer Science) online this semester. I was the e-Learning Contact for my board for several years, but this is my first time teaching online in “real life” (i.e. not a professional learning session). Overall I’m fairly happy with how I approached the design of my course, and I’ve also learned a few things that I’ll improve upon. 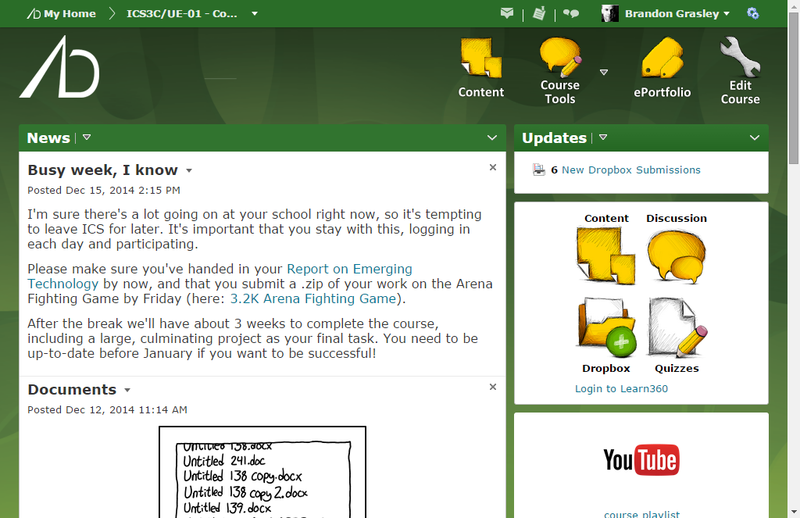 I work in Ontario using the Desire2Learn/Brightspace platform. The Ministry of Education here has provided a “starter course” for each of my classes. I’ve discussed the problems with the format of that course before (see here), and thoughts I had about improving on it. I mostly followed my own advice. In the end, there were significant differences between the provided course materials and the approach I wanted to take with the course, so I ventured out on my own. I use the News area to share interesting links, reminders, and extra details. Notice I don’t post a news item every day; I’ve decided that’s too much without a real payoff. I post a lot of “instructional videos” in the course. The videos show me coding applications live, so students can hear my thinking while I work, see the errors I make and how I correct them, and see how the development environment works visually. Of course, playing videos successfully in the online learning environment is a bit device-dependent, so I also post every video to YouTube. I maintain them in a playlist (here) and I post a link in a widget on the course homepage. The YouTube videos also have the advantage of sometimes being faster to download, and users can change the resolution on the fly (not very helpful for code, I suppose). And most importantly, those videos are available for anyone on the Internet to use. That makes me feel good in my heart. 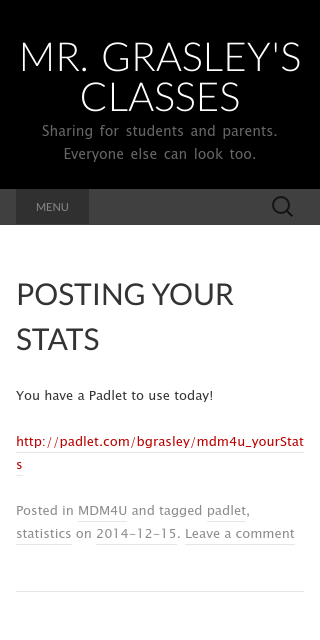 In an out-of-the-way place on the course homepage I maintain a Padlet. I use this to post related-but-not-necessary links. I don’t use the Calendar directly, but I do use due dates for Content items so they show up in the Upcoming Events list. More on that later. I used to only put due dates on the items that needed to be submitted/completed, like Dropboxes and Discussions. After helping an e-Learning student in the library here with her English class, I realized that students were using the Upcoming Events list in the Content area. 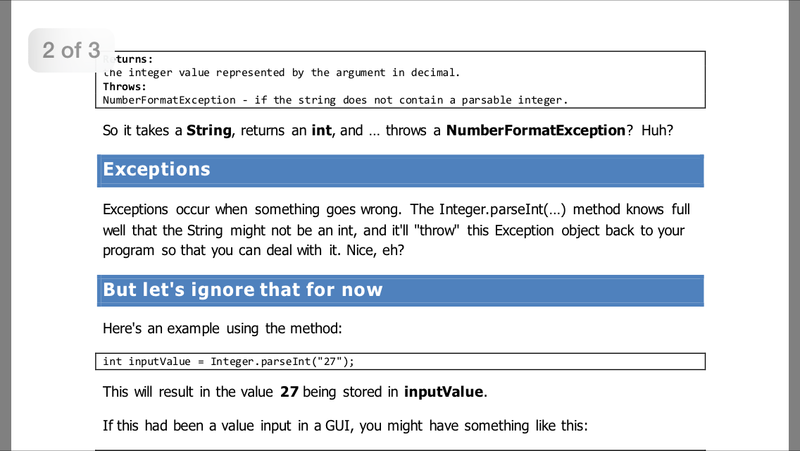 I had never explored it before, but it was a sparse list in my course. Now I add due dates to Content items which I want students to consume as well; for example, I put a due date on 3.2E, which is a video I want them to watch by the end of today. They don’t have to submit anything, but I’m hoping the due date helps to keep them on track. 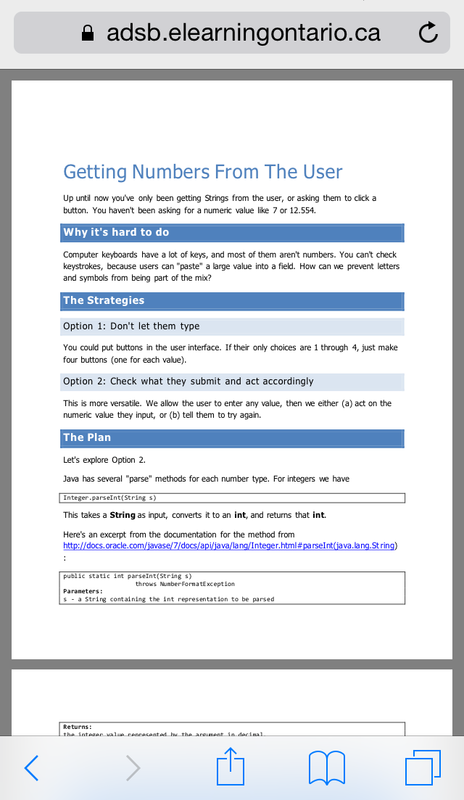 I have tried to use HTML, Word documents, and PDF files to post CS content, but I’m happiest posting a PDF that I generate in Word. I get excellent control over the look and feel of the text/images, but the links I put in there still work. It’s also universally-readable. HTML takes too long to format correctly/beautifully, and Word documents are rendered as images by D2L (disabling any links). In the end I think the videos are more valuable for the students, especially later in the course. I have several students now requesting videos explaining a certain aspect of the course, but not a lot of PDF requests. I have a lot more to learn, but I’m pretty happy with the workflow I’ve developed now. Suggestions are very welcome! Tonight I got out of my comfort zone again at school. Mr. Aceti, music teacher, theatre guy, etc., organized a coffee house as a fundraiser for the local Soup Kitchen and invited me to sing and play guitar. I was nervous, and so were most of the students. Lots of them said things like, “I’m not very good, but here’s a song by so-and-so.” It was an eye-opener in light of my own trepidation; for some reason I thought the students would be more comfortable with performing. I played guitar and sang “Creep” by Radiohead (with lyrics modified, of course). I think it went pretty well, although it’s hard to tell from behind the microphone. I think someone recorded it with their phone, so I might ask around so I can watch/listen to it. There were lots of great student performances, and it was nice to meet some kids that I don’t teach (and probably won’t teach this year). I think it was a valuable experience for all of us, breaking past fears and shyness and just sharing with friends and strangers. There was a climate of support and encouragement in the room, which was awesome.